This year we had an opportunity to conduct fieldwork twice: as the 2013-14 wet season was concluding last April, and then this month just before accumulation began again. In addition to collecting data and working at the AWS, our visits bracketing the dry season were designed to investigate seasonal changes in the stable isotope composition of accumulation, as well as the extent and effects of meltwater percolation through the snowpack (i.e., mass redistribution). Collaborating this month with Margit Schwikowski's group from PSI (Switzerland), we also drilled an ice core which will hopefully extend the 2003 ice core record of Lonnie Thompson up to the present. The team of Dr. Theo Jenk, Jogy Schindler & Reto Schild discovered that their lightweight drill was ideally suited for Quelccaya, and they established a new depth record for the equipment! Ironically, drilling was the easy part in some respects, for getting the gear in and out of Perú has required a full 2 weeks of effort by our logistics guru Benjamin Vicencio, Theo, and several diplomats. The ice is currently in a Lima freezer, but we anticipate shipment to PSI this week. The new drilling is in support of collaboration with Mathias Vuille and John Hurley at the University at Albany, as part NSF-sponsored research examining the climatological history of the South American summer monsoon. An overview of this project is available here. 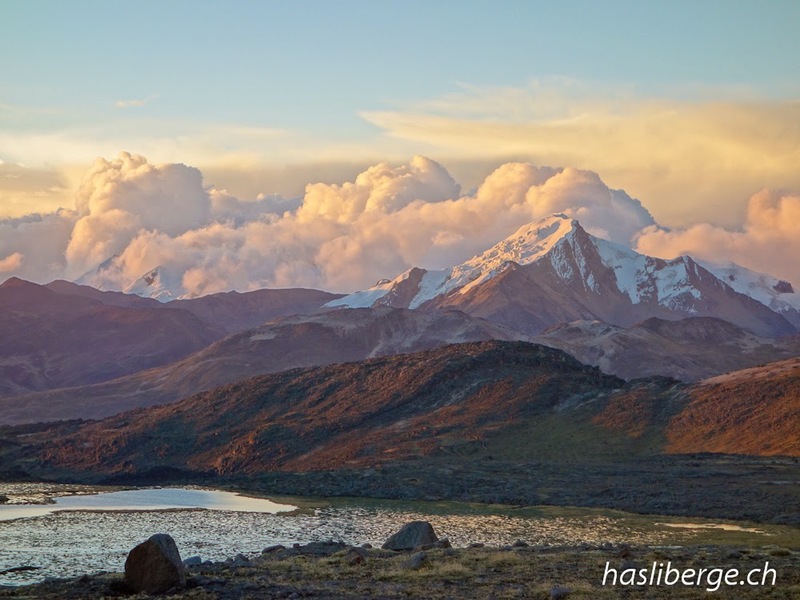 The image above was taken late in the afternoon by Reto Schild near our main camp at 5,200 m. It nicely depicts Cordillera Vilcanota weather and environment during late October this year - aspects of which will be discussed and illustrated here in greater detail. Note, for example, dramatic convection caused by increasing atmospheric instability at this time of year. The Vilcanota landscape is a mosaic of starkly contrasting environments, whose attributes were especially apparent this October; extreme 2013-14 accumulation remained on glaciers at the highest elevations, yet with longer days and higher temperatures at this time of year, considerable low-albedo ice was exposed below the transient snowline. As a result, meltwater runoff from glaciers was much greater than that of the core dry season, flooding bofedales and lakes (see image). Where present, water in this landscape supports a fascinating biodiversity, as demonstrated to us nightly by a chorus of frogs outside our tents... in sub-freezing temperatures at 5,200 meters! Quelccaya Ice Cap and Vilcanota glaciers are receding rapidly. With their shrinkage, water resources will decline, and lead inexorably to environmental and ecological change. Without meltwater runoff from glaciers during the dry season, the landscape will be very different, as sparse vegetation in the foreground and middle distance suggest. But while the glaciers remain, we are attempting to learn as much as possible about them, the paleoclimate archive they record, and the ecosystems they support.